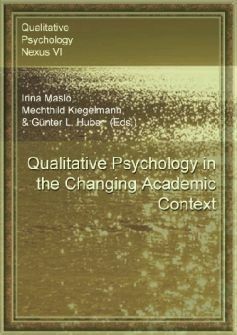 "Qualitative Psychology in the Changing Academic Context"
comprises documents and contributions of the seventh international meeting on qualitative psychology. It was organized by EARLI SIG 17 "Qualitative and Quantitative Approaches to Learning and Instruction", the Centre for Qualitative Psychology and the University of Latvia to deepen our joint understanding of learning and instruction in the changing academic context. It took place in Riga (Latvia), October 20-22, 2006 as the SIG 17 meeting between the biannual EARLI conferences. The workshop was held in the guest house Medzabaki, in Lilaste, about 30 km from Riga. There were 28 participants from seven countries - Spain, Germany, Switzerland, Austria, Canada, Sweden and Latvia. The participants focused on discussing the contributions of qualitatively oriented psychologists in Europe and the changes that are taking place currently in the European academic world following the Bologna process. - Contribution of the presenters' studies to promote the development of academic psychology and pedagogy. Empirical Justification of the Interuniversity Joint Master Degree on "Educational Treatment of Diversity"
Qualitative Research Methods: "Analysis of Interviews and Focus Group about Strategies of Learning in Primary School Paying Attention to the Students of Foreign Origin"
A Combination of Quantitative and Qualitative Research Methods for Data Sequential Analysis in PhD Thesis "Transdisciplinarity of Learning for Promoting Physical Literacy"
The Basic Concept for Following and Evaluating of Learning/Teaching in Evaluation Process: the Role of Teachers - or - What Do Teachers Really Need to Teach?